Memorial Day. Pause. Reflect. Remember. I am a progressive woman married to a Gulf War-Era U.S. Army Veteran. On the surface this may seem like an odd pairing or a case of “opposites attract.” Once you meet my extremely progressive husband, who is a Reagan Republican, the attraction becomes clearer. (We met and got married, after he was honorably discharged and returned to the U.S.). Hubby and I are proud of his service as an Army Sergeant. He spent the majority of his career in Europe and took advantage of every opportunity to immerse himself in the culture of the country of his posting. He grew up in a family that celebrated learning, and like mine, his vacations were a combination of fun and education. While he was in Germany, he researched his German and Polish ancestry, visited the concentration camps and took advantage of free days at local museums. He also took advantage of drinking in pubs, dancing in clubs and meeting the “enemy” – Soviet soldiers, who also happened to be drinking and dancing at the same bars. Hubby suffers from Post Traumatic Stress Disorder, as many former (and current) servicemen and women do. He self-medicated, ignored, denied and finally, sought help for his condition. Some days are more difficult than others, but I have never met a stronger, more gentle and kind, man. His inherent kindness is most passionately expressed when he talks about our troops currently serving and those who are falling through the cracks, as they return to civilian life. His dream is for them to have the best tools needed for their jobs and the appropriate medical support, when they begin the process of reintegration. 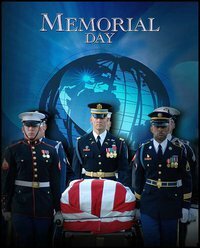 Today, we pause to reflect on what Memorial Day is, and why it exists. Sadly, too many of our young, strong, intelligent, brave and healthy men and women are still fighting wars around the world. Our greatest service to them should be ensuring their families are taken care of while they are on active, or reserve, duty. Then, we should demand, and be prepared to support, full health care for all injuries, physical and mental, sustained while they defended our freedoms. Anything less, is insulting and degrades their personal sacrifices. I honor Hubby, the men and women who have served, and continue to serve, and their families. “Thank you” seems too small a sentiment. This entry was posted in Army, Military and tagged Memorial Day, progressive, Reagan.